As you may have gathered from the header for my blog and my profile picture, I’m rather fond of snow. Although this love has been with me for many years, it was science which got me into skiing: science is very international, and a couple of my students grew up close to the Alps and naturally went skiing every winter. This was the spur that sent me and The Inelegant Gardener on our first skiing holiday, in the Austrian village of Westendorf. After a week of being too hot, too cold, too much in pain, too scared: in the car back from the airport we swore we wouldn’t book a second holiday for at least a week, we lasted three days before booking the next trip! Why is it so addictive? Perhaps it’s the massive amount of light you get from a blue sky and a white ground at a time of winter’s deepest darkness, perhaps it’s the gorgeous scenery made magical by snow, perhaps it’s the feeling of moving at speed with little effort, or the feeling of powdery snow piling up to your knees as you glide, with your skis submerged, through fresh snow. Between looking at the spectacular views, eating the goulash soup in the toasty mountain restaurants, gliding down the mountain with grace and elegance and the moments of panic when discovering you are on a piste somewhat beyond your ability, there is much of scientific interest to be found on the mountains. Growing up in England, I’d never really believed that snowflakes had six-fold symmetry – English snow seems to come in big puffy flakes or rain. Actually to demonstrate the point, we have just been subjected to a fall of little icy pellets. Whilst skiing I was exposed to proper perfect snowflakes which I watched settling on my coat arm as I trundled up a slow chairlift. 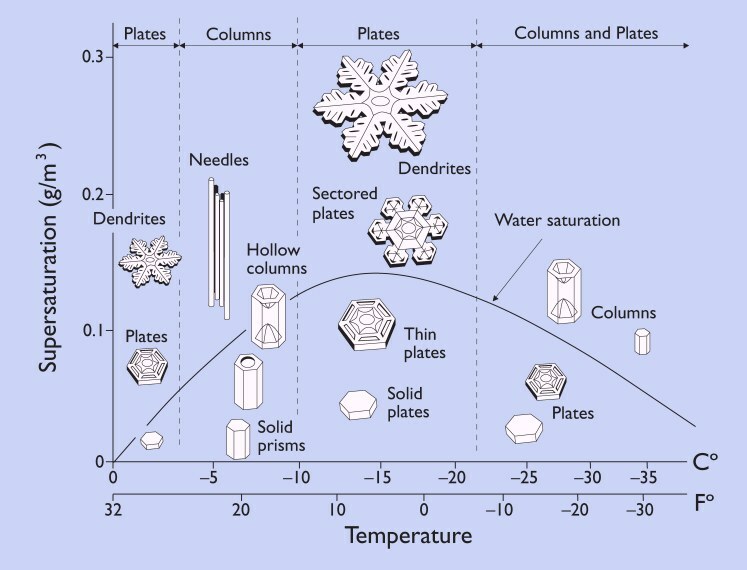 The difference is all down to how cold the air is and how much water vapour there is in it, this is shown in the snowflake shape diagram here. Actually, this simplifies things a little: the diagram shows what you get when you make snow in the laboratory under carefully controlled, fixed conditions. In real life a snowflake will experience a range of conditions as it falls to earth, which will all contribute to the shape it’s in when it lands. In England this means ‘an irregular blob’, in the Alps it means ‘pretty snowflake’. 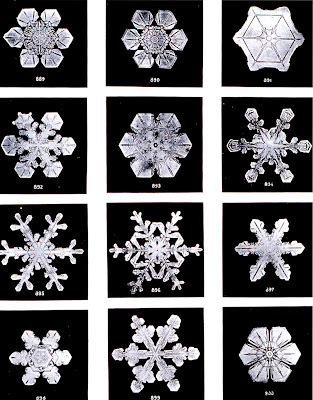 You can find out much more about snowflakes on Kenneth G. Libbrecht’s website. 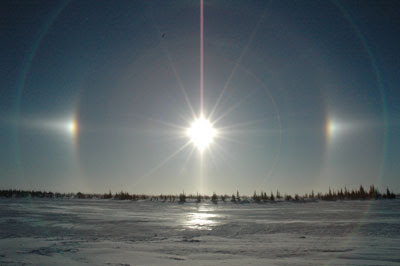 Sundogs are the short arcs of light either side of the sun. These form under certain atmospheric conditions, bloody cold ones in my experience, the air is filled with tiny thin, hexagonal plates of ice, which drift gently to earth. As they fall they align so that their flat faces are parallel to the ground. They act like little prisms, the little prisms mean that light coming towards you from the sun is thrown out to the side – leaving a gap close to the sun and a bright spot further out. Since they are aligned relative to the ground the sundogs are most obvious either side of the sun (as opposed to a ring all the way around). This is explained in more detail here, along with many other atmospheric optical effects. Snow also impinges on my own field: the physics of appearance. Consider this: water in a glass is a colourless, transparent liquid; ice (made properly) is similarly transparent, yet clouds (made from tiny water droplets) and snow made from crystals of transparent ice are white. The difference being the microscopic structure of the material. Calculating the details of the reflectivity of snow and clouds is an active area of research for people interested in atmospheric physics, and climate change. There are so many other things I left out of this post such as wind-sculpted snow, glaciers and the mechanics of skiing itself (although I’ve found that thinking too much about what I’m attempting to do on skis normally leads to a fall). There is a book dedicated to mechanical aspects of skiing: The Physics of Skiing by David Lind and Scott Sanders. Ever the keen observer, I have discovered that the hairs in my nostrils freeze when the air temperature is around -10°C, take a deep breathe through your nose: if you get a prickling sensation then it is at, or below, -10°C. I did try snowboarding once, and from this learnt where my coccyx was and just how much it could hurt! And by the power of wikipedia, I discover there is a special name for this hurt: coccydynia.